I use my knowledge of industrial paint-making chemistry to create black-on-black renderings of my existential connections to my socio-political identities. I create portraits, landscapes, and celestial bodies that describe these identities as forms of protection or escape from oppressive systems. Informed by Afrofuturism & Womanism, I explore the simultaneous limitations and liberations I have associated with these colors, cultures, and identities of blackness. Christa Pratt is a painter/visual artist currently living and working in Brooklyn, NY, where she also studied Fine Arts Painting at Pratt Institute. Born in the Bronx but raised in the South, the artist’s current work deals with blackness and solitude, expressing every emotion that she has attached to the identities/concepts of blackness and womanhood, be that strength, lingering sadness, sensuality, hopelessness, pride, etc. 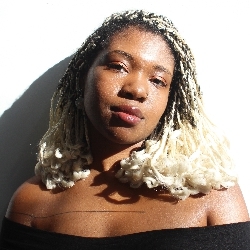 Through her artwork, she has tried to create a safe and empowering space for black women. She was an artist-in-residence at the Museum of Arts and Design’s Artist Studios Program for 2017, and her work has been featured in group exhibitions at Arts EastNY, Studio 301 NYC, and Spring/Break Art Show.